Mycotoxicoses – this isolated group of diseases of humans and animals that were triggered by certain types of fungi. In the process of life produces toxic substances mycotoxins. Such toxins are most often available in plant products. Lose products the fungus occurs under adverse weather conditions, harvesting, and improper storage. Contaminated agricultural products and food can cause mycotoxicosis in animals and humans. Mycotoxicoses is a disease, which develop due to the ingestion of mycotoxins that are produced in the process of vital activity of fungi. Allocate approximately 300 mycotoxins, which produce about 350 species of microscopic fungi. But contaminate food and feed all 20 of them. The most common and dangerous to human health are aflatoxins B1, B2, G1, G2, M1, producers – mushrooms of the genus Aspergillusj, trichothecene mycotoxins (including deoxynivalenol) and zearalenone (producers – fungi of the genus Fusarium), the ochratoxins, citrinin, citreoviridin (producers – fungi of the genus Aspergillus and Penicillium), ergot alkaloids, including lysergic acid and agroclavine. Mycotoxins in grain and other products are quite resistant to external factors. That is why the treatment of food from such toxins is a difficult task. Familiar to all cooking methods can only partially reduce the amount of these substances. Heating to high temperature, freezing and ultraviolet treatment effect is also not allowed. Food and agricultural feed that are contaminated by toxins, often changing their appearance. Whereby it is easy to determine their unsuitability. vegetables and fruits that began to rot. Mycotoxins tend to accumulate in animal meat, eggs and milk they give. All of the products can be a source of human infection and lead to serious consequences. To some it may seem that mycotoxicosis is a relic of the past. However, more recently in Malaysia died a group of children infected with aflatoxin tasting noodles. Mycotoxicoses in the body increase the risk of cancer. If microorganisms have infected a pregnant woman and possible congenital disease in the fetus. You need to know that mycotoxins can have an impact on the genetic structure of man. 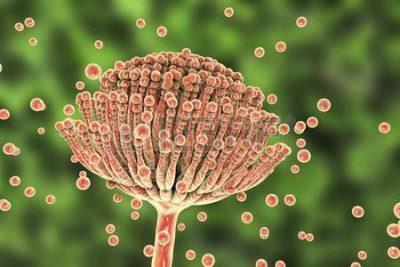 The most common and investigated fungal pathogens of intestinal diseases is A. flavus, the aflatoxin. These mycotoxins are detected in grain, corn, coffee, rice, cocoa beans, and some fruits and vegetables. Most often they are in cereal crops, less in meat and dairy products and eggs. Even a small amount of these toxins are able to affect the health of young children, with immature immune systems. If the toxins of this group regularly appear in the human body, it manifests with persistent weight loss, and children with slower growth. Quite often, the toxin causes a disease of domestic animals – pigs, goats, and calves, in addition to the sensitive microorganism and birds – ducklings, goslings and poults. When infected the possible demise of up to 100% of the total population. Already made the direct link between liver cancer and aflatoxin. When the grain harvest winters under the open sky, there is a high probability of infestation by the fungus Fusarium. Waste products of this fungus is stable enough. They do not break down under high temperatures and have resistance to various chemicals. Microorganisms can live in grain for several years. These toxins provoke the development dangerous for human disease alimentary toxic aleikia. There are signs of a sore throat, and General condition of a person is somewhat worse. The level of white blood cells drastically reduced somewhere in 10 times. Decreased level of hemoglobin in the blood. On the patient’s body noticeable characteristic rash. In severe course of the disease gradually begins the necrotic process in all tissues. Doctors believe mycoses and mycotoxicoses quite dangerous diseases that require treatment certain medicines. 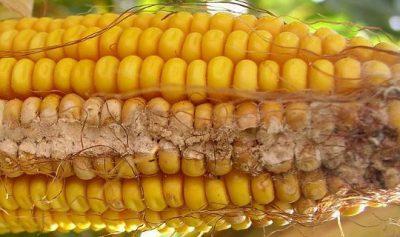 The grain is infected with Fusarium mycotoxins, are not suitable for humans and animals. Such products may be used only for technical purposes, for example, for the manufacture of industrial alcohol. Corn that is infected with a mycotoxin fumonisins, can be used also only for technical purposes. This toxin is resistant to temperature changes and exposed to many chemical agents, the partial destruction of microorganisms occurs only during prolonged frying. Mycotoxins in animal feed can cause disease and loss of livestock. Therefore, only purchase feed from approved suppliers. When serious illness can be confusion and hallucinations. Mycotoxins in the flour can lead to necrosis of the extremities and face. The treatment of this disease is symptomatic and primarily aimed at the removal of General intoxication. The first measure of prevention of ergotism is a thorough cleaning of the wheat from the dispute. This group of mycotoxicoses often found in animals and rarely in humans. The causative agent is a toxin produced by the fungus Stachybotrys alternans. Stachybotryotoxicosis is quite a severe disease of cattle, horses, and poultry. The clinical picture is quite unfavorable, first, inflammation develops in the digestive tract, and then begin necrotic changes in the organs. 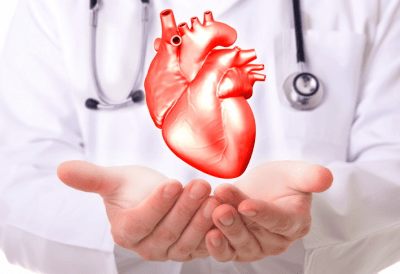 Observed violations of the heart and agranulocytosis. Another disease provoked by mycotoxins is dendrologists. This disease affects the cardiovascular system of the animal, which ultimately leads to death. Dendrologists is characterized by rapid flow and a high percentage of mortality in animals. No less dangerous are other waste products of fungus. These include ochratoxin A and patulin. For the synthesis of the first toxin requires high humidity products, which shall be not less than 22%. Such mycotoxicoses lead to severe poisoning in farm animals and disruption of mochevyvodjashie system in humans. Ochratoxin, once in the body lactating women, able to penetrate into breast milk. Special studies confirm the carcinogenic effects of this toxin on the human body. 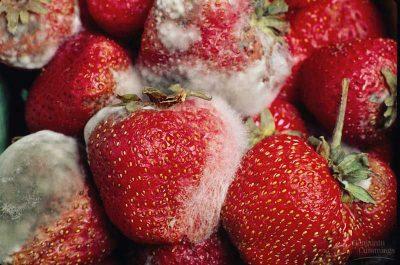 Patulin tends to accumulate in fruits and vegetables that are beginning to rot. You need to consider that patulin is resistant to high temperature, therefore, is found even in juices and jams, which were heat-treated. Most often this mycotoxin found in Apple juice. Appearance of fruits and vegetables that are contaminated by mycotoxins can be almost neizmenenny. On the surface it may be just one tiny speck of rot. Some people cut the rotten areas of apples and eat such fruits. You can not do that, because you can get sick with mycotoxicosis. Plant breeding is one of the most effective ways of dealing with moldy fungi. Unique development of genetic engineering is able to develop crop plants resistant to microorganisms. The correct application of agricultural technologies, the crop should be collected in accordance with the developed technology. In addition, it is very important to arrange proper storage of the harvested crop. Products are thoroughly cleaned from the affected areas. Storage crops are laid in a well-ventilated area with normal humidity. Before the grain is processed, it tests for the presence of mycotoxins. In case of detection of micro-organisms products are carefully cleaned and, if necessary, withdraw the entire batch from production. Not always just for appearance products can certainly say that she’s infected. Often it is necessary to conduct a number of laboratory studies. Do not feed the animals culled wheat. 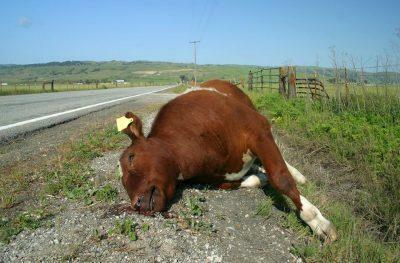 This can lead to loss of all livestock. Mycotoxicoses – these are diseases that most often have a chronic course. Gradually accumulate in the body, toxins eventually begin to disable various internal organs and systems. That is why at home is so important to prevent the formation of mold on foods. You need to remember that a predisposing factor for the reproduction of moldy fungi is high humidity and temperature. 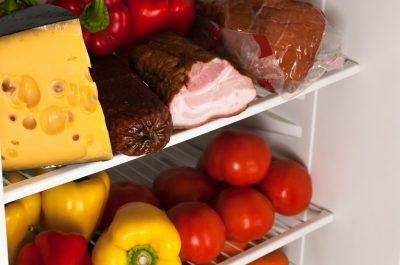 Products that are perishable should be kept in the refrigerator and before eating a good look. If the products there was mold, you must give up eating them and have no regrets to throw in the trash. It is fair to say that not all mold is dangerous. But to risk your health not worth it. It must be remembered that these savings can result in serious health problems. This rule applies to all foods – vegetables, fruit, baked goods, preserves and other conservation. You can not cut rotten fruit and berries and eating them. This is especially true of children, who have immature immune system and high risk of Contracting mycotoxicosis. Food for Pets should be periodically examined for the appearance of mold on the beans. If infected seeds in the total mass of feed found, to give such food is not recommended. Any food mycotoxin able to cause great harm to both animals and poultry. People can become infected from animals with mycotoxicosis, eating the milk or eggs of sick animals. While he could not understand what was happening to him, as the symptoms resemble poisoning. Not only adults, but kids love to eat dried fruits, nuts and succulent fruit. These products are quite useful to humans and is a source of vitamins and important trace elements. But it is useful only if of high quality and stored in compliance with all conditions. At the slightest damage these products can carry the risk of mycotoxicosis. There are cases when people cut started to rot the Apple and eat it with pleasure. But you can not do that, as all the pulp is infected with a mycotoxin and can cause dangerous disease.